Steven Spielberg gave film fans one hell of a valentine this morning with the release of the first teaser trailer for Indiana Jones and the Kingdom of the Crystal Skull, which hits theaters on May 22. Head on over to IndianaJones.com to view the trailer in standard or high definition. Like most longtime fans of the Indiana Jones series, I was skeptical when this film was announced. I grew up with the first two films—particularly Temple of Doom, which I still love despite realizing it’s the weakest in the series—and once I discovered Last Crusade on video years later, I was hooked on the character for life. Would Kingdom of the Crystal Skull be just another cash-in sequel to capitalize on childhood nostalgia? Thankfully, this teaser trailer has eased any and all anxieties I may have had. Ford is still iconic with his trademark fedora and whip, silencing any detractors claiming he is “too old” to play the legendary treasure hunter. The film also reunites Ford with Raiders of the Lost Ark co-star Karen Allen, reprising the role of Marion Ravenwood. With a supporting cast that includes Shia LaBeouf, Cate Blanchett, Ray Winstone and John Hurt, this film shouldn’t disappoint. Then again I was also pretty excited when I saw the first trailer for Star Wars Episode 1: The Phantom Menace and we all know how that fiasco turned out. 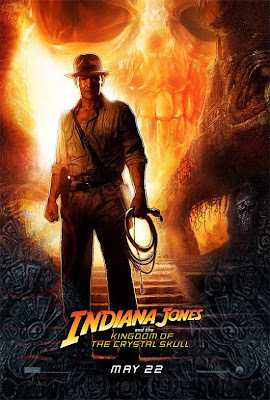 Judging by the trailer and the little information released thus far, it seems that Indy is taking a trip to South America to retrieve a crystal skull (duh) before the Soviets do. The trailer confirms that Area 51 plays a role, as does that cavernous warehouse we saw at the conclusion of Raiders. Throw in what appears to be a long-lost son, and you have an adventure that promises to stand up to the originals. But don’t listen to me, click the link above and see it for yourself.